We racked our brains and spoke to our experienced move co-ordinators to come up with the Ultimate Home Removals Checklist for you to use when you are looking at moving house. Please find the guide below with handy links to help you along the way. 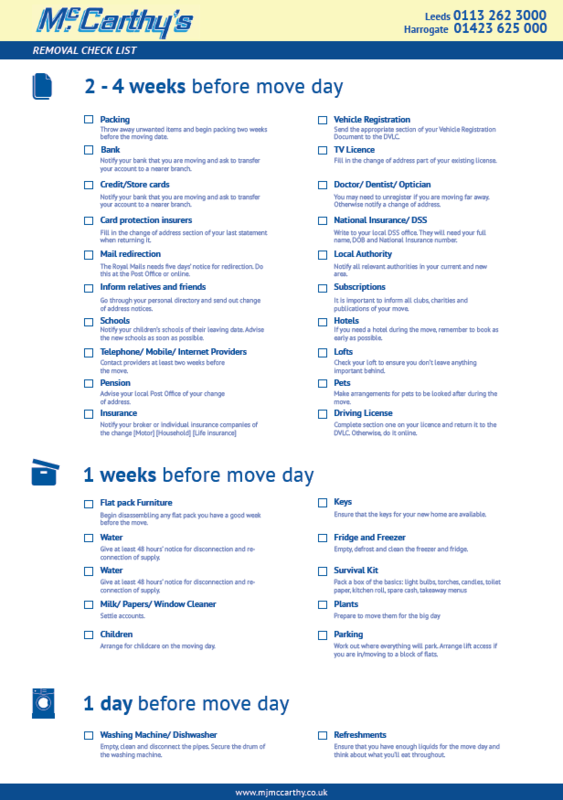 You can also find a downloadable checklist in a handy PDF, you can print it off and use it to ensure you have sorted everything before your big moving day. Because lets face it moving house is stressful enough, without having to write lists of things you might forget. Throw away unwanted items and begin packing two weeks before the moving date. Think of investing in some boxes and moving kits. Send the appropriate section of your Vehicle Registration Document to the DVLA. Notify your bank that you are moving and ask to transfer your account to a nearer branch. Fill the change of address part of your existing licence. You may need to unregister if you are moving far away. Otherwise notify a change of address. Fill in the change of address section of your last statement when returning it. Write to your local DSS office. They will need your full name, DOB, and National Insurance number. The Royal Mail needs five days’ notice for redirection. Do this at the Post Office or online. Notify all relevant authorities in your current and new area. Go through your personal directory and send out change of address notices. It is important to inform all clubs, charities and publications of your move. Notify your children’s schools of their leaving date. Advise the new schools as soon as possible. If you need a hotel during the move, remember to book as early as possible. Contact providers at least two weeks before the move. Check your loft to ensure that don’t leave anything important behind. Advise your local Post Office of your change of address. Make arrangements for pets to be looked after during the move. Complete section one on your licence and return it to the DVLA. Or, do it online. Begin disassembling any flat pack, you have a good week before the move. Ensure that they keys for your new home are available. Give at least 48 hours’ notice for disconnection and re-connection of supply. Empty, defrost and clean the freezer and fridge. Pack and label a box of essential items for your first night: toiletries, spare clothes, towels. Pack a box of the basics: light bulbs, torches, toilet paper, kitchen roll, spare cash, takeaway menus. Prepare to move them for the big day. Arrange for childcare on the moving day. Work out where everything will park. Arrange lift access if you are in/moving to a black of flats. Empty, clean and disconnect the pipes. Secure the drum of the washing machine. Ensure that you have enough liquids for the move day and think about what you’ll eat throughout.